McCullough is coming off a torn ACL injury that he suffered on January against Florida State. Before the injury, however, McCullough had seen his draft stock fluctuate as he mixed flashes of potential with spells of disappointment. Physically, McCullough checks off all the boxes. He's a six-foot-nine forward with tremendous athleticism for his size and a seven-foot-three wingspan to top it off. McCullough also has good lateral quickness and can run the floor well for his size. His athleticism shows itself especially with his work on the boards and as a shot blocker. And even when he's not blocking shots, he's constantly altering them. Offensively, McCullough brings a lot of potential to the table. He has a good handle for his size and is very dangerous in transition. He uses good angles when cutting and can finish at the basket with regularity. McCullough can also stretch the floor with the ability to knock down the open 15-18 footer and can shoot both when set and off the dribble. He's great on the offensive glass, using quick reactions along with his length to snag boards to keep plays alive. He's still an improving offensive player, but when he comes back healthy McCullough has a lot of potential to succeed at the next level. Although he has added weight, McCullough has to continue to keep adding strength to his body to match up with the physicality of the NBA. At this point, he doesn't possess a back-to-the-basket game offensively. 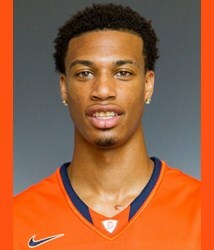 He was seen in his short time at Syracuse mostly relying on his athleticism and plays off pick-and-rolls to score. A big concern with McCullough heading into the draft is his toughness. He tends to shy away from physical contact on both ends of the floor. Offensively, he prefers to shoot a floater rather than penetrating aggressively to the basket. Defensively, he has to do a better job of putting a body on his opponent and boxing out instead of out-jumping for rebounds. At times, he struggles guarding physical forwards. He prefers defending by the perimeter or mid-range area than against back-to-the-basket bigs. Adding strength to his body should help him get better on both ends of the floor. McCullough, although good, tends to take a play off on defense far too much. His focus isn't always there and he has been listed as lazy. Offensive players get in front of him far too much which causes him to get in constant foul trouble. His foul trouble often has to do with lack of strength in the paint and also lack of focus, being at times a half second too late to react to plays.